Tanner Howell, a 2013 graduate of Boulder City High School, was drafted by the Minnesota Twins on June 6 in the 2018 Major League Baseball amateur draft after a successful four years at Division II program Dixie State University in St. George, Utah. DSU Athletics/Stan Plewe Tanner Howell, a 2013 graduate of Boulder City High School and senior right-hand pitcher at Dixie State University in St. George, Utah, was selected in the 35th round by the Minnesota Twins on June 6, 2018, in the Major League Baseball amateur draft. Selected in the 35th round (No. 1,024 overall), Howell called fulfilling his lifelong ambition to be a professional ballplayer a dream come true. No stranger to playing in front of fans on the big stage, Howell, a versatile pitcher, served this past season as Dixie State’s closer, arguably the game’s toughest position. Appearing in 18 games, Howell recorded six saves, which ranked him third in the Pacific West Conference. He proved capable of taking the game well into innings; four of the six saves came in multi-inning outings. Howell also made two starts and posted a 3-2 record in 45 innings of work. His 39 strikeouts were third best on the staff this season. What role Howell would take with the Twins organization is unclear for now. The 6-foot-5-inch right-hander is open to all suggestions, but he said he hopes to stay in the closer role. Leaving Dixie State as the program’s career leader in appearances, with 53, Howell said he is hopeful to make the same impact at the next level. Setting goals for himself like he did as an Eagle and with Dixie State, Howell embraced the idea of staying focused on what’s important. Bobby Reese, Howell’s coach at Boulder City High School, said he was proud of his former star pupil for not only fulfilling his dreams but also serving as a role model for the next crop of Eagles. 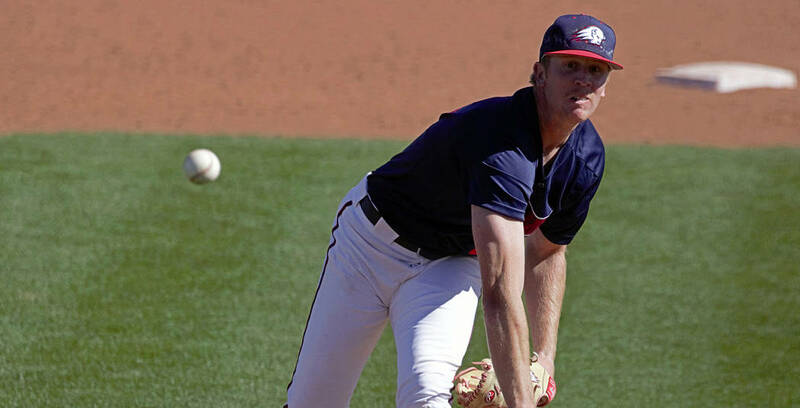 On his way to fulfilling his dreams of making it to the major leagues one day, Howell is spending time at the Twins’ spring training facility in Fort Myers, Florida.